I love how the arts crossover and weave together. I think these quotes can apply to many disciplines as well as to music. The more we know about the “rules” of writing, the more free we are to intentionally break them. The second quote reminds me that to be a writer, a musician, an artist, a friend, a mother, or a teacher requires a level of attention that is heightened by the love and connection we have to life and living. 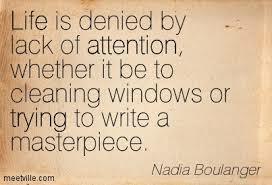 “Life is denied by lack of attention.” That may be one of my new favorite quotes. Think how much life is enhanced, enjoyed, and enriched by the attention we give to detail, to children, to humanity. Today I started teaching 2 boys who for very different reasons are struggling readers. One is a twin and has had developmental delays; the other is from a home where there is emotional and physical abuse. The first has difficulty with comprehension due to expressive language delays. The second is in crisis. He has chosen to go silent in school and produces almost no work. I love these boys and have known them for a few years. I hope that my time with them will be the attention they need. I hope I can be a teacher, be true to the art, serve the child, and reach deeply for the heart and soul of the learner. Beautiful connections made between music, art, writing and living!! Those two boys are so lucky to have you in there life.